March has two new moons. The first is on the 1st. First quarter follows on the 8th, full moon on the 16th, and last quarter on the 24th. The second new moon of the month is on the 30th. Both inner planets are at greatest elongation in the morning sky this month. Mercury is 27.6° from the sun on the 14th. This greatest elongation is best for viewers close to the equator and in low southern latitudes. Just a few days later on the 19th, Mercury is at aphelion. The planet will be 0.467 astronomical units (Earth-Sun distances) from the sun. Venus is at 46.6° from the sun on the 22nd. 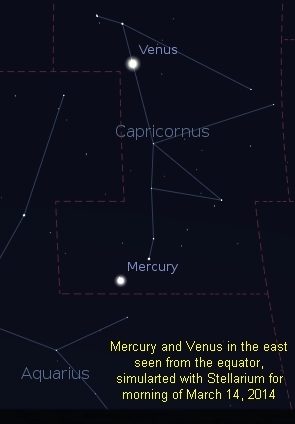 The moon will pass 3.4° north of Venus on the 27th and 5.9° north of Mercury on the 29th. Mars is north of Spica all month, moving westward. The moon is in the neighborhood on the 18th and 19th. The red planet will be 4.8° north of the star on the 25th. If you have a telescope, watch Mars with it this month. The planet is getting slightly bigger and will continue doing so until it’s at opposition on April 8. Saturn is also moving westward slowly in the diamond of Libra. The moon passes by on the 20th and 21st. For some viewers, the moon will occult Saturn on the morning of the 21st. Much of Brazil and the South Atlantic will be in the visibility area for this event. Jupiter is near the star Mebsuta in Gemini. The big planet is nearly stationary as March begins. By the end of the month, it is moving noticeably eastward from night to night. The moon will pass 5.1° south of the planet on the 10th. People in parts of the state of New York some provinces of Canada should hope for good weather and get up early on the 20th. Regulus will disappear for 12 seconds! An asteroid named 163 Erigone will pass right in front of it. This occultation is visible along a 45-mile wide path that starts in the Atlantic Ocean, crosses land from New York City to Bath, Ontario, to the Attawapiskat-Peawanuck area along Hudson Bay to the Baker Lake area of the District of Keewatin. Visibility times will be range from 6:06 to 6:15 Universal Time for those spots. There’s a SkyCaramba page with more information about this occultation. People in North America have been through a very cold winter. They may take pleasure in the spring equinox happening on the 20th at 16:58 Universal Time.